Chateau La Garde has a long history in what was then known as the Graves region, In fact, Chateau La Garde dates back to at least 1732, when the chateau was built. 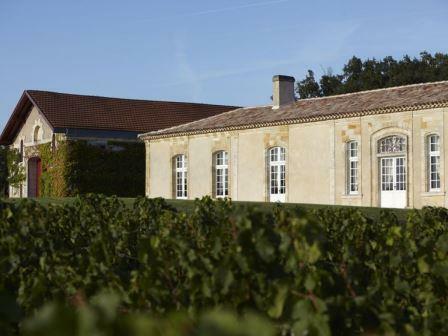 The property was sold from negociant, passing from the Lacoste family, (who gave their name to the Pauillac estate, Grand Puy Lacoste) to the Eschenauer family. During the period of the 1950’s and 1960’s, the wines were sold under the name of Clos La Garde. The modern age for Chateau La Garde begins in 1990, when it was purchased by the Dourthe group. The Dourthe group owns several vineyards in Bordeaux, and they are also one of the more powerful negociants with their CVGB company. The large, 53 hectare, Pessac Leognan vineyard of Chateau La Garde is planted to 62% Merlot, 31% Cabernet Sauvignon, 5% Cabernet Franc and 2% Petit Verdot for the red wine. That is the majority of the vineyard, as you will see. For the white wine, 3 hectares of vines have been reserved which are planted to 85% Sauvignon Blanc and 15% Semillon. All of their Sauvignon Gris has been removed and replaced by Sauvignon Blanc and Semillon. Chateau La Garde has the highest portion of Sauvignon Gris planted in Bordeaux. The vineyard is young, with an average of 20 years for the vines. The vine density is quite high, at plants of 14,000 vines per hectare. The terroir is gravel with clay soils for most of the vineyard. There is a bigger portion of limestone and a cooler terroir, where the grapes for the white wines are planted. To produce the wine of Chateau La Garde, the red wine is whole berry fermented in temperature controlled, stainless steel vats. Malolactic fermentation takes place in tank. The wine is aged in 35% new, French oak barrels for between 12 and 15 months. The white wine of Chateau La Garde is vinified in barrel. Malolactic fermentation takes place in barrel. After malolactic fermentation, the lees are removed and placed in a tanks for one month, before being returned to any barrel that is deemed light. The wine is aged in 15% new, French oak barrels for 10 months. There is a second wine, La Terrasse de La Garde. The average annual production of Chateau La Garde is close to 14,000 cases per year. Chateau La Garde can be enjoyed on the young side with decanting. Young vintages can be decanted for an average of 1 hour or so. This allows the wine to soften and open its perfume. Older vintages might need very little decanting, just enough to remove the sediment. Chateau La Garde is usually better with at least 3-6 years of bottle age. Of course that can vary slightly, depending on the vintage character. Chateau Le Garde offers its best drinking and should reach peak maturity between 6-15 years of age after the vintage. Chateau La Garde is best served at 15.5 degrees Celsius, 60 degrees Fahrenheit. The cool, almost cellar temperature gives the wine more freshness and lift. The red wine of Chateau La Garde is best served with all types of classic meat dishes, veal, pork, beef, lamb, duck, game, roast chicken, roasted braised and grilled dishes. Chateau La Garde is a perfect match with Asian dishes, hearty fish courses like tuna, mushrooms and pasta as well as cheese. The white wine of Chateau La Garde is a perfect wine to serve with shellfish, sashimi, sushi, all types of seafood, chicken, veal and cheese. Honeysuckle and pomelo with lemon chiffon on the palate will be perfect with fresh, grilled seafood this summer. Freshly squeezed grapefruit, honeysuckle and vanilla pop right out of the glass. The wine is fresh, crisp and refreshing. Herbal notes with olives and fresh red fruits are found here. This medium-bodied wine offers soft tannins and an elegant finish that should drink well on release. Soft, sweet, dark red fruits, earth and black cherries. The wine is sweet, fruity and fleshy with an open, dark, red fruit filled finish, with just a hint of peppery spice in the end note. Waxy lemon and grapefruit on the nose is coupled with nutty pineapple notes in the round finish. Drink this on the young side. Bright, fresh, forward and loaded with sweet, juicy, citrus and lemon peel, along with a touch of honey suckle, the wine is crisp and refreshing. Medium bodied, fresh, early drinker with a spicy, smoky, earthy, red fruit character and a soft, ready to go finish. You can enjoy this young. Easy drinking, smoky, polished, soft red and dark red fruits with hints of oak, this is a wine to drink on the young side. Ready to drink charmer, round in texture and medium bodied, with a smoky, cherry, thyme, coffee and earthy essence. Popped and poured was all it needed.